“The Second Best Exotic Marigold Hotel” got off to a strong start this weekend, opening at No. 1 and topping the original in all three overseas markets in which it debuted this weekend. The sequel, directed by John Madden like the first film, brought in $9.4 million overall for Twentieth Century Fox. The U.K. was tops with $5.8 million, Australia brought in just over $3 million and New Zealand delivered $496,000. 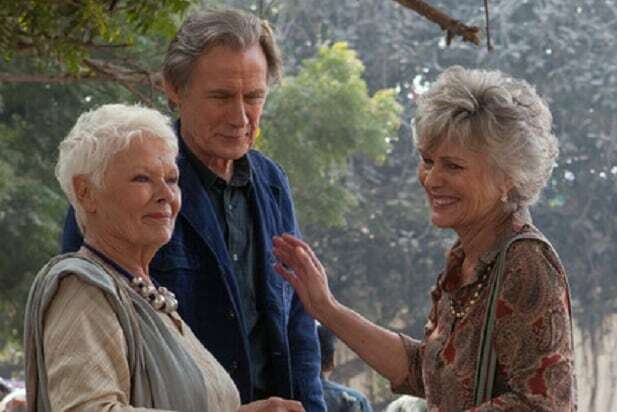 Judi Dench, Maggie Smith, Dev Patel and Bill Nighy return from the original “Best Exotic Marigold Hotel,” which cost $10 million to make and brought in $147 million worldwide in 2012, with $90 million coming from overseas. Richard Gere joins the cast. It was good weekend overseas for Fox in general as “Kingsman: The Secret Service” continued to perform strongly and “Birdman” got a bump from its Best Picture Oscar victory. “Fifty Shades of Grey” was the top film globally for the third consecutive week. adding another $36 million from abroad. It has brought in $338 million internationally to pass “Ted” as Universal Pictures’ highest-grossing R-rated film abroad ever, and will cross the $500 million mark at the worldwide box office this week. “Big Hero 6” debuted in China with an estimated $14.8 million, the biggest opening ever for a Disney animation release there, ahead of the $14.1 million that “Frozen” managed last year. In Japan, it held strongly to remain the top animated release there for a ninth consecutive weekend. “Focus,” the R-rated caper comedy starring Will Smith and Margot Robbie, brought in $12.2 million from 31 markets, or about 30 percent of its eventual rollout. It debuted at No. 1 in Russia with $3.2 million for Warner Bros.
“American Sniper” opened in Germany and posted the biggest debut for a Clint Eastwood movie ever with $3.4 million. Austria ($510,000) and Belgium ($517,000) were also best-ever debuts for the director. The Iraq War saga added $19.5 million from foreign markets this weekend, and is up to $139 million from overseas, and $441 million worldwide for Warner Bros.
“Kingsman,” the comic book adaptation starring Colin Firth as a super spy, brought in $25.8 million this weekend to up its foreign total to $124.6 million. It remained No. 1 in South Korea in its third week with $5.2 million and has taken in $24.2 million there. It also posted strong holds in France ($2.4 million) and Taiwan ($1.8 million). The worldwide total for the Matthew Vaughn-directed spy spoof is $210 million. “Birdman” opened with a strong $1.6 million from 159 screens in France and took in $5.6 million overall this weekend to raise its foreign total to $46 million and its worldwide haul to $86 million. Three Chinese films were still resonating in their second weekends. “From Vegas to Macau 2” ($22 million), “Wolf Totem” ($17 million) and “Dragon Blade” ($12.5 million) held the Nos. 7-9 spots on the global top ten chart thanks to their showings at the Chinese box office.